The CCPI has several dozen forks mounted on resonance boxes (see left photograph). These were used as frequency standards in research and lecture demonstrations. The addition of the resonance box was first made in 1839 by the French instrument maker, Albert Marloye (1785-1874). The resonance box has one open end, and a length typically one quarter of the sounded wavelength in air (λ). 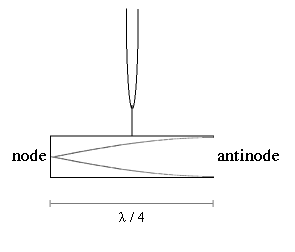 The standing wave in the box has a node at the closed end, and an anti-node at the open end, as shown in the diagram. 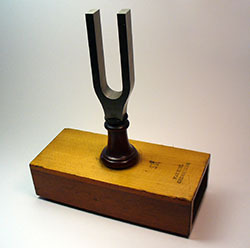 This results in a sound that is more focused and louder than the tuning fork alone.